Alexander James Harvey (5 February 1935 – 4 February 1982) was a Scottish rock and blues musician. Although his career spanned almost three decades, he is best remembered as the frontman of The Sensational Alex Harvey Band, with whom he built a reputation as an exciting live performer during the era of glam rock in the 1970s. Harvey was born in the Kinning Park district of Glasgow (also reported as the Gorbals in the show Great Scot and corroborated by the Wikipedia article about the Gorbals), a working class neighbourhood, where he grew up. By his own account, he worked in a number of jobs, from carpentry to being a waiter at a restaurant to carving tombstones, before finding success in music. He first began performing in skiffle groups in 1954. On Friday, 20 May 1960, at the Town Hall in Alloa, Alex Harvey and his Big Beat Band opened for Johnny Gentle and His Group, "His Group" being the Beatles (John, Paul, George, Stuart Sutcliffe and Tommy Moore), on this the opening night – and biggest audience – of the Beatles' seven-date tour of Scotland with Gentle. His musical roots were in Dixieland jazz and skiffle music, which enjoyed considerable popularity in Britain during the late 1950s. From 1958 until 1965, he was the leader of Alex Harvey's Big Soul Band, playing blues and rock and roll songs and spending considerable time touring in the United Kingdom and Germany. He also won a competition that sought "Scotland's answer to Tommy Steele". Harvey became strongly identified with British rhythm and blues music, although he was equally able to play rock songs. After leaving the Big Soul Band, he briefly tried for a solo career but with little success. By 1967, he found a positive direction for his career, when he became a member of the pit band in the London stage production of the musical Hair. This band recorded the live album Hair Rave Up, which contained Harvey originals and other songs not from the stage show. In 1970, Harvey formed Rock Workshop with Ray Russell; their first, self-titled album contained an early version of "Hole in Her Stocking", later to appear on Framed. Harvey remained with Hair for five years. Harvey was also instrumental in the formation of the band Stone the Crows by introducing his younger brother, Leslie "Les" Harvey, to singer Maggie Bell. Also in Stone the Crows was bassist James Dewar, later of Robin Trower fame. Les Harvey was electrocuted in a freak accident while performing with the band in 1972. In 1972, Harvey formed The Sensational Alex Harvey Band (often shortened to SAHB) with guitarist Zal Cleminson, bassist Chris Glen, and cousins Hugh and Ted McKenna on keyboards and drums respectively, all previous members of progressive rock act Tear Gas. SAHB produced a succession of highly regarded albums and tours throughout the 1970s. The band never achieved acclaim in the United States the way it did in Great Britain, but it had a cult following in certain US cities, especially Cleveland, where the group first played at the Agora Ballroom in December 1974. Thanks to airplay from WMMS, songs like "Next" and "The Faith Healer" became very popular. Cleveland remained a city where the Sensational Alex Harvey Band had a devoted following. However, they were unable to replicate that popularity in most other US cities. 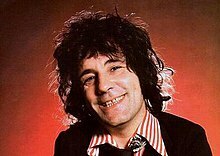 The Sensational Alex Harvey Band had Top 40 hits in Britain with the single "Delilah", a cover version of the Tom Jones hit, which reached number seven in 1975, and also with The Boston Tea Party in June 1976. After Harvey left the group later that year, the other members continued as SAHB (Without Alex) producing the album Fourplay. Harvey re-joined the group for 1978's Rock Drill. SAHB with Alex toured the UK in Autumn 1981 with the last gig at Workington's Carnegie Theatre on 1st November. After he left the band for good he released two more solo albums and went tour with his solo band from 1979. On 4th February 1982 on the way to the next gig in Belgium, Harvey died from heart failure, a day before his 47th birthday. Harvey was married twice and had two sons, one from each marriage. In 2002, a biography of Harvey by John Neil Munro was published: The Sensational Alex Harvey. The Sensational Alex Harvey Band were voted the fifth greatest Scottish band of all time in a 2005 survey. On 4 February 2012, a rowan tree was planted in memory of Harvey on the grounds of the People's Palace museum in Glasgow. The tree was planted by Alex Harvey Junior and the remaining members of the band. A limited edition book entitled Alex Harvey: Last of the Teenage Idols, photographed by Janet Macoska and edited by Martin Kielty was released for the 30th anniversary of his death. Two novels by Christopher Brookmyre, The Sacred Art of Stealing and A Snowball in Hell, reference SAHB's work. On 18 March 2016 Universal Music released a 14 disc box set of Harvey's work, entitled The Last of the Teenage Idols. This multi-disc set was the most comprehensive compilation of Harvey's music to date, including many rare and out of print titles. ^ "Rock Workshop album description". Angel Air Records. 13 March 2006. Archived from the original on 15 January 2010. Retrieved 31 December 2009. ^ Logan, Nick &Woffinden, Bob (eds.) "The New Musical Express Book of Rock", W.H. Allen &Co. Ltd (Star), 1973, p. 450. ISBN 0-352-39715-2. ^ Jane Scott. "Alex Harvey Dies on Boat." Cleveland Plain Dealer, February 12, 1982, p. T-23. ^ Anastasia Pantsios. "Rock Beat." Cleveland Plain Dealer, July 25, 1980, p. T-34. ^ "Alex Harvey". Electricscotland.com. Retrieved 2 January 2012. ^ "Entertainment | Belle named 'best Scottish band'". BBC News. 12 January 2005. Retrieved 6 August 2014. ^ "Alex Harvey – A Tribute – People's Palace – Glasgow". Events.glasgowlife.org.uk. Archived from the original on 10 July 2012. Retrieved 30 March 2012. ^ "Alex Harvey : Last of the Teenage Idols". Alexharveybook.com. Archived from the original on 28 January 2012. Retrieved 6 August 2014.